Round Here: ABNH 2nd Birthday Blog Hop! 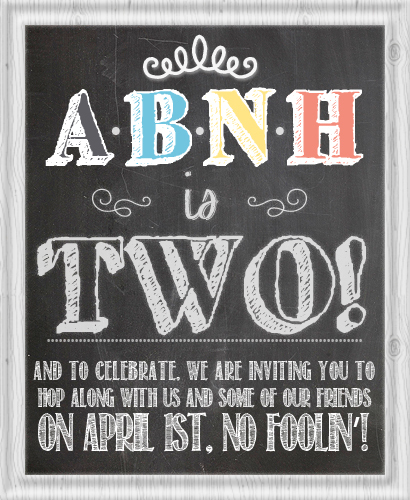 ABNH 2nd Birthday Blog Hop! To create my card, I first stamped the Happy Birthday Grid onto white cardstock with Hero Arts Tide Pool ink, and then diecut a butterfly from the center area. I stamped the same image again with Simon Says Stamp Doll Pink ink and carefully diecut the exact same area out as the Tide Pool one. I cut out several butterflies from black cardstock and glued them all together to create one thick diecut piece. I then cut out the pink grid area and adhered it to a matted black and pink piece of cardstock. I adhered the black stacked butterfly in the center and then completed it by adding the Tide Pool butterfly on the top. You end up with a great dimensional butterfly that stands out from the card because of the different coloured inks and the great dimension under the butterfly. To complete the card, I added some pool coloured sequins and gems and also went over the larger Happy Birthday word with my Wink of Stella clear marker. Make sure to leave a comments on all the blogs in the hop for a chance to win a prize pack from Hero Arts or Simon Says Stamp! The next stop on the hop is my awesome and funny friend Leslie Hanna (aka Crooked)! What a great look, and very clever. I love the effect the butterfly gives to the card! The stamped butterfly looks fab! Very cool card...Love this effect! Thanks for the chance to win! I love the stamp you used! The card is so nice! so going to try this!!!! Happy Birthday to you ABNH! Great card! Love all the layers to the butterfly! I love this technique because you can make a matching card with the leftover pieces! Two for the price of one. Your color choices are bright and cheery, too. What a cool way to use a die cut! Love it. Very cool technique using that fun background stamp! The dimensional effect on the butterfly is clever, but I think what caught my eye most was the use of the grid. Thank you for being a part of the birthday blog hop. love the black layers under under your butterfly, give just that extra bit of dimension. Beautiful card! I love the butterfly! Gorgeous card - love the dimension you achieved!! such a clever technique and pretty too! TFS! Lovely and I love the dimension you created with the butterfly. Like how you added the dimension with the butterfly. I love how you did this card. Wonderful card! I love that 3-D effect and the different color just enhances it even more. TFS! 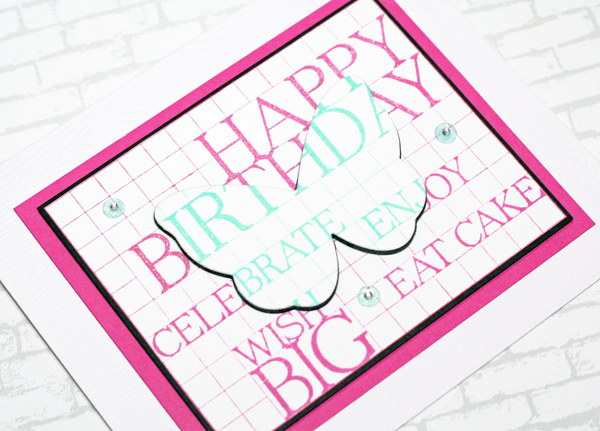 Fabulous idea and super fun card! Another cool technique to try. Enjoying the blog hop very much, I'm discovering lots of "new to me" talent along the way. Happy Birthday ABNH! Thanks for the opportunity to win a great prize from SSS, or Hero Arts. This card is gorgeous I love the technique you used thanks for sharing! Wow! I love this card! You are really creative! Neat card! Looks like you put a lot of time into it. Love this fun card, Stephanie! Thanks so much for being part of the hop! This is a really neat csrd...love this die cutting technique. I love the dimension on your card and the pops of black! Love this creative design, very clever!!! cool how you did your die cut with the colors. Oooh! This is so cool, I am going to have to lift this idea! Great idea for a three dimensional die cut. What a creative idea, Stephanie - love the double colour effect! I'm sure this is more complicated than you make it seem! Love the technique! Totally gorgeous!! Love the thick matt. Will have to try this. Looks awesome. Your card is very beautiful!!! Love the effect with the two colors!! Great graphic card!! That looks so cool, Steph! I love it!!! LOVE THIS CARD STEPH!! It just looks so fun, simple, and amazing all in one! Amazing card! I love the inlaid diecut - but the show-stopper is the shadow created by the black layers - brilliant! Cool card, love the black layer under the butterfly to add to the look of the card. Love the layered die cut - very cool! I love the colors and the dimension of this beautiful card. Thanks for the inspiration. I really love that stamp and what a lovely card. Congrats on the second anniversary from ABNH. Thanks for sharing. Magnified! this is new for me! I love the colors you used for your card! Excellent technique, it pops and floats at the same time! Nice card, great idea with the butterfly! Love the colors and technique! OMG your card is amazing I love it to pieces. I am totally in awe of the look of it. 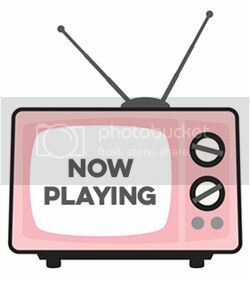 I wished you had a video to share I soooooo love it!!! You are a very clever and and creative gal. YOU ROCK!! Great technique. That popped diecut really adds wow to the spotlight technique. Beautiful! Love that the butterfly is of a different colour, it really pops out! what a fun idea - love the look! Totally fun idea for a great birthday card! Love all the cards that I have seen so far on this hop. The colors are fabulous, and the ideas are awesome. Happy Birthday ABNH. Here's to many more years! Cheers. Love the grid design of those Hero Arts stamps! I would never have thought to use those two colors together and, just look how gorgeous! Thanks for the great layering ideas. Love the card. Cute card. I've been eyeballing that stamp for a while wanting to try something similar. Great card! Really like the stacked butterfly affect! What a fabulous looking card1! Love the butterfly!! The raised butterfly is awesome! I love this card! Pink, black and white makes such a striking card! Beautiful! I have always loved this technique. It's so inventive and clever. I've not yet tried it as it looks like a lot of fiddling but this inspires me. Wow, that is one cool card! Will need to try that soon. Thanks for sharing! What a fun variation on using the stamp design--and it could be used for lots of different designs. Thank you! Love that technique with the background! Great way to get more use from your stamps! Love the idea of the butterfly being elevated and stamped in different color! Clever reverse ink on the butterfly. Stunning effect. Love the magenta color! it is my favorite color! So smart! I like this technique..gotta give it a try! Love the stamping technique to add fun dimention to your fun card. What a creative way to use this stamp and add a little interest! Pretty cool. Love your card, that technique looks super fun, so different and unexpected! Thanks for sharing your card! Great card. Love the dimension you created. What a neat technique! Thanks for being part of the HOP. That's a pretty cool technique and it turned out really good. I need to get me some wink of stella markers they look like a lot of fun to use, and I love the bright pink! Sweet card - love the use of the butterfly. Great job! I would never be able to line them up that well. Very clever. I think I may have to try this technique. Thank you. Beautiful card! Love the different color for the butterfly and the dimension too. Wonderful job. Thanks for sharing. Very effective 3D effect with the butterflies! Wonderful card. I love the black you used to build up the butterfly! Thanks for sharing! Love the butterfly, adds that little extra something! Cool butterfly technique card! Lovin' it! Love, love this technique. And the butterfly really pops! I really like this effect. Great job. Wow! That's a really cool effect! Love this technique. It makes the most amazing cards. This is such a cool technique! Love it! I really need to try this technique. Very nice. Great card! Love your technique. Will have to try this one. Well, when I try this technique, I hope it comes out straight. Wow! I love this card! I'll have to give this one a try! Thanks for sharing! Great card! Makes you go "how did she do that?" Love your design for this card! What a unique design! I love it. This is a new technique to me - how stunning! Love this technique. Have seen it a couple times and have not tried. I love the technique you used on this card. I'll have to try it out as well as experimenting with the thickness of the butterfly! Wow love your card, really want to try it but I probably would mess it up. Like my 5 year old said when we watched one of your videos for the Online card class, " mum she is much better then you" and yes you are! That is an awesome card!! Love how the butterfly stands out. Love the card and the technique you used. Thanks for sharing. I just love blog hops! These are great ideas to try. Thanks! Very cool technique, love the card. Great card! Love the butterfly! Love the colors and dimensional butterfly! What a cool two tone effect! I love it. Love those two colors together. What work to cut out the exact same spot...even with a machine. Nice! Thanks for the inspiration! Love the dimension on your card ! Oooooo! I like! HA is awesome!! What a neat technique! I will remember this one. And your color choices are great too, TFS! this is a fantastic and beautiful card!!! You card has very pretty colors and I can't wait to see some real butterflies! While I was 1st looking at your card, I wondered how you were able to make it with 2 different colors of ink. I so appreciate the explanation! How cool! What a cool take on this technique - changing up the color. Thanks for the inspiration. What a great idea....I love this!!! Great way to put some dimension onto the card. Really great idea. Great card! Love that stamp! Love the butterfly in the mix also! Love this card and the technology behind it. This card is awesome! So cool with the butterfly! layer of words with butterfly, what a brilliant idea and result !! I love the dimensional butterfly. pretty card. great dimension on this card!! Love this!! Such a simple idea & it looks so fabulous! !